Who has line? Who has a hook? Just finding these things is a mighty hunt for these boys. 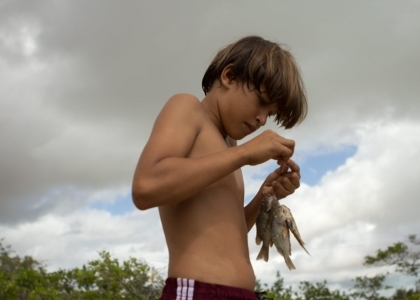 Finding what’s needed to play, or in this case to fish, is a game in itself. The boys of Tatajuba are always trying to find what they need, be it tins, hooks, wood, carnaúba straw, palm leaf stems, foam, plastic, essentially the primary materials to create a game itself. This stage is essential for play, it’s like a door that opens up to desire. With hook and line in hand, we walked over to the only bridge in Tatajuba for the next stage in the game: hunting for bait. 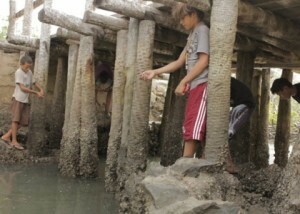 With rocks in their hands and their baladeira slingshots, the boys would shut one eye to get their aim right. 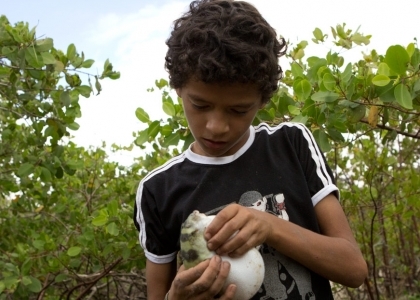 The maria farinha (a type of crab used as bait) will split in half if the shot is accurate. 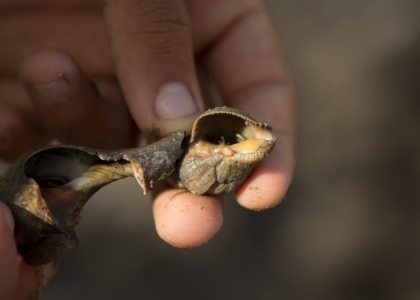 The buzo, another type of bait, is one of those shells that hides a little animal inside, it looks a little like a spider. This one is easier to catch but harder to find. The siri mole, or soft-shell crab, also works, and it wanders around in the water until someone can catch it with a stick and then grab it with their hand. Grabbing it takes courage, it has to be done right otherwise you’ll get bitten. They collect some bait in order to finally move on to the final stage: the actual fishing. 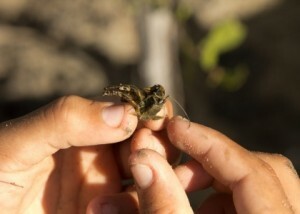 They open the bait, take out the sparse meat inside and place it on the hooks. Their eyes dive into the water to try to see the fish. They fish without rods, just using lines. The sensitivity of the fingers is essential at this moment, a slight tug on the line and the movements have to quick. 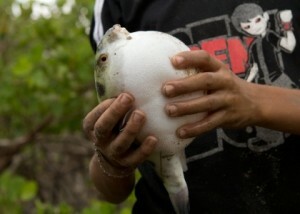 Antônio caught a baiacu, a type of puffer fish that blows up and eats the hook, breaking the line. They want to get the hook out of the belly of the fish at any cost, but no one brought a knife. 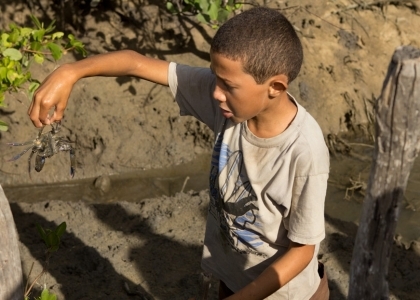 Antônio shows me the oysters the baiacú had to eat just by touching its belly. They know all about the risk poisoning if you eat this fish. 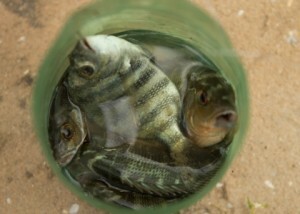 They teach us that it’s the fish’s liver that has the poison. They want to show us the liver and all the other organs. They are experts in animal anatomy, investigating from within, they try to learn about life through life itself. So much experiential knowledge from these boys in just one morning of fishing!